Charlotte, Vermont: Garden Way Publishing, 1983. 135 pp includes index. Ephemera of two newspaper clippings. 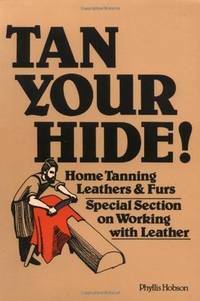 One about how to tan a bear skin and one on home tanning sheephides. With special section on working with leather by Steven Edwards. The author tells what tools and chemicals you'll need, how to select the hide, the steps for tanning leather and fur, how to test for tanning, old-time Indian tanning methods, how to make your own dyes, what qualities of leather to look for, which tools you need for leatherworking, basic leatherworking techniques, where to find tools and supplies. Softcover has some wear to edges. wee crease to bottom front corner, crease at spine from opening, a little dust soiling to pages' edges. Some pencil underlining on contents page. B/W illustrations and photos. A few finger smudges in text and some pencil underlining. A very useful, interesting book.. Fifth Printing. Soft Cover. Good. 9 x 6. New Jersey: Logos, 1972. 176 pp. The inspiring true story of a minister who moved his pulpit into the plice cars, to the ghettos, bars, gutter, to fight violence with faith. Original price 95 cents. Softcover has minimal wear, some faint creasing from holding, no spine creasing, faint scuffing. Former owner's name on bottom of first page. Text has browned a bit but is very clean, unmarked, no noticed corner folds. A good copy.. Mass Market Paperback. Good. 7 x 4 1/4. Kansas: Mayfield Research Co. 1976 Soft Cover. Very Good ++. 8 1/4 x 5 1/4. 31 pp Everything you need to know about a combine from making adjustments, to checking the grain and analyzing losses. Softcover booklet with stapled spine is in excellent condition. A bit of fading to back at spine..
New York, NY, U.S.A.: Ballantine Publishing Group, 1985. 220 pp. + complete list of names. The origins, history, meanings, nicknames and derivations of hundreds of names. Cover has no creases. No former owner's name. Text is clean and unmarked. A nice copy.. Mass Market Paperback. Very Good. 7 x 4 1/4. N.Y.: Avon, 1960, 1960. Soft Cover. 4 5/16 x 7 1/4. 128 pp. A splendid vintage pb in superb condition. Originally cost 40 cents. A true story. Won the Mystery Writers of America Award for the Best True Crime Story of the Yea r (1960). Story begins in 1613. Book includes index and bibliography. ". The story is true, but was it a royal crime of passion or a classic miscarriage of justice." Very min wear to edges. Exception ally bright, tight, and clean, as if never read. A lovely copy of this hard to find mystery. Overall cond: v. good..
London: Kaye & Ward, 1974. 90 pp Written by a professional ventriloquist tells how to choose what dummy to work with, how to make dummies, how to plan a routine, scripts to choose, how to write a comic dialogue, how to include magic in a routine, how to use ventriloquism to help correct speech defects. How to make the dummy's voice. Illustrated by author. b/w photos. Lib label on spine. Plastic cover taped to binding DJ has very little wear. Price sticker on lower front flap. school stamp on ffep. Pocket on rear free endpaper. Text is clean tight, unmarked.. HC and DJ. Fair-Good/Fair - Good.. Illus. by Darryl Hutton. 9 x 5 3/4. Ex-Library. Garden City, N.Y.: Doubleday and Company, Inc. 1958 HC and DJ. 8 1/2 x 5 3/4. 154 pp. "The Caucasus is a world that stretches its rugged, mountainous body from the Black Sea to the Caspian in the south of Russia." In 1929 Negley Farson and Alexander Wi cksteed hiked into this area. This book chronicles their adventure. This is a charming travel book, steeped in the nostalgia for lost and beautiful days, timeless places, and people of simple ways an d strong pride. DJ has b/w photo of the author set on background of blue and green. DJ has several small chips and min tears. Some darkening to rear. New mylar cover. Original price uncut from jacket f lap: $4.00. Binding is black cloth on board with blue and gilt lettering on spine.- excellent cond. Endpapers are map of :"The Lost World of the Caucasus". Bright, tight and clean. Very small name s ti cker spplied to far lower left corner of endpaper. Text has 16 chapters and index. A splendid copy of this remarkable travel book. DJ: good, Binding: fine, Text: fine..
Canada: Anansi, 1970, 1970. Paperback. First English Translation. 7 7/8 x 5 1/8. ISBN:0-88784-310-7. 113 pp. Translated ffrom French to English by SHelia Fishman. Cover design: Roland Giguere. La Guerre, Yes Sir was first publis hed in 1968 in Quebec by Editions du Jour. It is the first part of Carrier's trilogy from Quebec, providing a droll, crisply narrated portrait of that province's village life. Cover is shite with red handprint illustration; black lettering. Rear cover has b/w photo of Roch Carrier. Cover is in excellent cond with only min wear. No tears or chips. Endpapers are white, pristine. Text has Translator ' s notes. Entire text in superb cond. Overall cond: v. good..